The Australian Gliders have quickly put the disappointment of their last loss behind them, easily taking care of Algeria 90-25 in the classification games of the 2018 IWBF World Championships. Scoring the first eight points of the game and starting with a 17-1 run, the Gliders set the tone from the opening tip with Cobi Crispin (18 points, three assists, three steals) and Amber Merritt (12 points, five rebounds) making light work of the Algerian defence. Crispin's defence was also exemplary and made it difficult for Algeria to even make it across half-court. The young duo of Georgia Munro-Cook (28 points, nine rebounds, four assists) and Annabelle Lindsay (20 points) then came off the bench and maintained the pressure, pushing Australia's lead out to 26 at quarter-time. 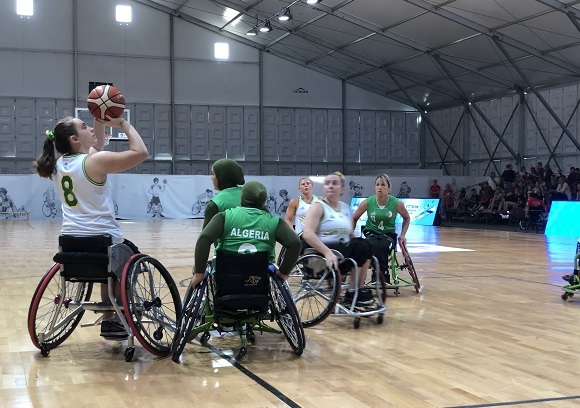 Algeria were able to respond in the second term, beating the Gliders down the court for some easy points in transition but Australia continued to hit the scoreboard at the other end of the floor. The Gliders then finished the half on a 12-2 run with Shelley Chaplin (four points, five assists) able to get in on the act and a 14-2 run to begin the third period officially put the contest to rest. Australia was able to tally 39 points off 32 turnovers while committing only six errors themselves and with Shelley Cronau (three points, 13 assists, three steals) leading the way, they also recorded 28 assists on 43 field goals. The Gliders will now prepare for their final game of the tournament tomorrow as they take on Brazil, a team they beat in the group stage, in a battle for ninth place.